A close-up of multiflora rose blossoms. The five white petals are less than an inch long. The blossoms develop into small red rose hips in late summer. Birds eat them and spread the seeds far and wide. June is the month for roses, including a fragrant wild white rose that is one of the most common invasive plants in Westborough. Multiflora rose (Rosa multiflora) is the only white wild rose in our area. The other wild roses are pink. Its leaves have 5-11 leaflets. And like many other roses, it is armed with thorns. 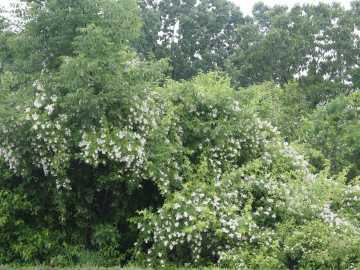 In early June multiflora rose – "many-flowered rose" – bears abundant large clusters of small white blossoms that give off a light fragrance when they first open. If you look around as you drive local roads, you'll get an idea of just how common it is. You can easily notice it in bloom near roadways and at the edges of parking lots. Among other places, you can see it beside the railroad bridge across East Main Street, on the right as you head out of town, and on the front lawn of Westborough High School. You'll find it thriving both in sun and partial shade, and on flat areas, steep slopes, and stream banks – a clue to how easily it makes itself at home in different environments. You'll probably also see that it forms thickets and climbs over other plants, including small trees and shrubbery. This dense growth shades out native plants. You can also spot multiflora rose earlier in the year, in late April, but for a different reason. Like many other invasives, it's one of the first plants to green up and leaf out. This trait is easy to notice in the open fields at Mass Fish and Wildlife if you walk the paths there in early spring. Its clumps of arching stems are easy to pick out in the still-brown landscape. By leafing out before most of the native vegetation, multiflora rose and other invasives get a head start in the growing season. A few months from now, multiflora rose will once again become noticeable when its many fruits turn red in late summer. The blossoms develop into small berry-like rose hips that contain its seeds. Each plant produces up to half a million seeds that can last up to 20 years in the soil. These large numbers of long-lasting seeds help to make this rose invasive. Portrait of multiflora rose – picturesque but invasive. This bush is more than 15 feet high, covering shrubbery and a small tree. Every year a single multiflora rose plant produces up to half a million seeds that can last up to 20 years in the soil. How does this invasive rose travel as far as it does? If you've wondered how that wild white rose in your garden or hedge got there, birds are probably the answer. They eat the attractive red fruits but the seeds pass unharmed through their digestive tracts. Some of our favorite birds such as robins, cedar waxwings, and wild turkeys spread the seeds. Other wild animals such as mice, rabbits, and deer also eat and spread the seeds. These creatures give the seeds wings and legs. But how did multiflora rose travel to North America in the first place? As usual with invasive, humans are responsible for its arrival. 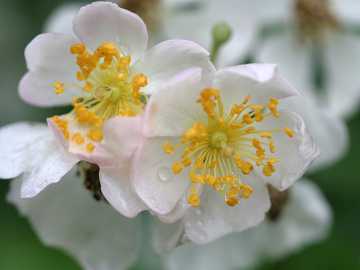 It was brought here in the 1860s from Asia, where it is native to China, Korea, and Japan, for use as a rootstock for grafting ornamental roses. It served this purpose well because it grows in different types of soil and a variety of environmental conditions. Much later, from the 1930s to the 1960s, multiflora rose was deliberately and widely planted for soil conservation along highways and in other places. People used it as a "living fence" along the edges of fields and pastures. They also planted it to provide food and shelter for wildlife. It now covers an estimated 45 million acres in the eastern United States. It's hard to think of a rose as a bad thing, especially when it's easy to grow. But if you've ever cleared a patch of multiflora rose out of your yard, or cut a trail through a thicket of it, or had to free your clothing or flesh from its prickers, you've had a hint of its downside. Horrific tales – such as how a friend's brother-in-law lost an eye to it when a thorny branch snapped across his face while he was clearing a patch – don't seem so far-fetched if you've tangled with it yourself. Be careful if you try to remove it! As of January 1, 2006, Massachusetts prohibited the importation, propagation, and sale of multiflora rose. But there's plenty of it here already. What's to be done? Part of what makes multiflora rose so invasive in North America is its lack of natural enemies to keep it in check. So scientists are looking for some enemies that will go after it but leave other roses and plants alone. The familiar Japanese beetles (Popillia japonica) eat multiflora rose, but they too are an invasive species. They can't serve as a control because, as gardeners know, they also like other roses and many other plants. Three insects and a virus are currently under investigation as possible controls for multiflora rose. And if you're inclined to keep goats, it turns out that goats have no problem munching on multiflora rose.